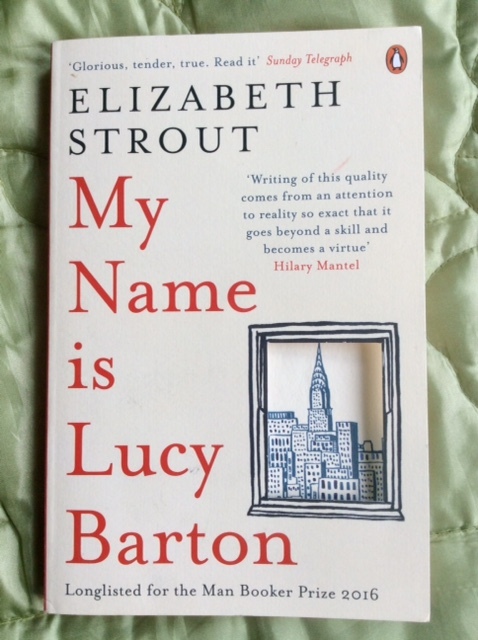 Elizabeth Strout, My Name is Lucy Barton. Penguin paperback, 2016. First published in the USA 2016. Is the visit of her mother at the hospital overlooking the Chrysler building in NYC, a woman from whom she’d been estranged for so many years, who beat and traumatised her as a child, partly to mitigate (in Lucy’s eyes) the more brutal and disturbed behaviour of her war-damaged husband, Lucy’s father? Is her visit a real event, or does Lucy imagine or hallucinate it? She’s in hospital for a serious somatic condition (or is it?) that requires nine weeks of treatment, but we never learn exactly what it is that ails her. Is her illness in her head? Is she really ill, or even in hospital? All this happened back in the seventies. After all, the warping events that bent her out of shape as a child make me feel that the unexpected appearance of her mother after such a long separation, and who colluded in her fierce, abusive upbringing, is more of a deus (dea?) ex machina than a realistic event. This is a mother who did nothing to prevent her PTSD-suffering husband from cruel treatment of his children, such as shutting up Lucy, when she was a little girl, in the cab of his truck when they were both out at work all day. On one occasion a snake entered the cab and so freaked her out she can’t even bear to hear the word ‘snake’ as an adult. He publicly humiliated her little brother when he innocently dressed like a girl; now he seems even more traumatised than Lucy. I found the first half of this novel deeply affecting. Then it began to pall a little after such a dazzling start. The fragmentary structure – each chapter is very short, sometimes just a paragraph, and written in lucid, simple prose – perfectly conveys the mosaic of mostly bitter memories the narrator Lucy pieces together as her drug-dumbed mind tries to cope with this unprecedented solicitude from a mother she loves dearly, but who showed little in return when she was little, and is still incapable of saying now that she loves her daughter. The mother is a damaged Madonna, a vampire nurse, who seems to need contrition and her daughter’s nurture as Lucy needs a gesture or expression of love and kindness from her – which is not forthcoming. The kids when growing up were so poor they felt deeply the insults and mockery of their peers at school, who sneered at their ragged clothes and unkempt, filthy appearance, their uncouth manners. If her mother’s sequence of stories is to be believed, nearly all of Lucy’s former female acquaintances married badly and are now divorced or worse. Has she embroidered the truth in order to deflect Lucy’s attention from her own neglect, or to exculpate herself? It interests me how we find ways to feel superior to another person, another group of people…Whatever we call it, I think it’s the lowest part of who we are, this need to find someone else to put down. The deceptive simplicity of style here and through the novel, the colloquial, unadorned register, are used to express some profound and gnomic insights into the human condition – and in particular into the tribulations and recriminations of the mother-daughter relation. I like writers who try to tell you something truthful. Telling the truth: that’s what she’s trying to do here. In a work of fiction. I think I know how she spoke of the fact that we all have only one story, and I think I don’t know what her story was or is. I like the books she wrote. But I can’t stop the sense that she stays away from something. hurl onward through life, blind as a bat, but on I go! This is the ruthlessness, I think./My mother told me in hospital that day that I was not like my brother and sister: “Look at your life right now. You just went ahead and …did it.” Perhaps she meant that I was already ruthless. Perhaps she meant that, but I don’t know what my mother meant. Refreshing to find a narrative voice that doesn’t profess to know everything. Maybe she isn’t yet ruthless. There’s pity for this cruel mother, for one. Elizabeth Strout’s Olive Kitteredge, about which I wrote last December, I found a more fully realised and satisfying novel. 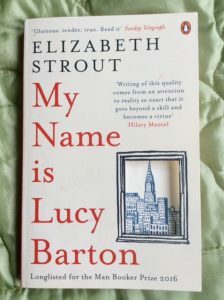 This entry was posted in American Literature and tagged Elizabeth Strout, My Name is Lucy Barton, Penguin Books by Simon Lavery. Bookmark the permalink. A very thoughtful review, Simon. It’s probably not for me right now – the subject matter sounds somewhat bleak and traumatic. Nevertheless, I’ve no doubt that Strout is a very good writer. I read Olive Kitteridge earlier this year while I was offline – what an interesting and fully-realised character Olive proved to be. You weren’t completely bowled over by this one, and yet you’ve succeeded in tempting me. I haven’t read Olive K., so I won’t be able to make any unfavourable comparisons. Have you read the early version of Sons and Lovers ? Izzy, no. Particularly disappointed because it began so well – like when Lucy moves to the city from the back of beyond and is shocked by the ‘disgust’ shown by urbanites for provincials like her. That laconic, chatty style grated a little, even though, as i tried to show, it often conveyed profound sentiments. The tortured relation with her mother is sensitively done: bittersweet. I think the early S and L was called Paul Morel, wasn’t it. I’ve not read the whole thing, but have read about its differences from the final version. A son’s bond with his mother as depicted there is interestingly different from Lucy’s: she’s desperate to establish a connection with her mother – who’s incapable of conveying back to her daughter what she wants. And as my quotations suggest, she doesn’t really know what she knows, or wants.